Josh Frankel | DC Graphic and Web Design » What Does the Term “Comp” Mean? Ive used the term comp for what seems like forever. While I am usually using the term in the context of a design proof, I had no idea what the abbreviation originally referenced. After some searching I found a great explanation from Vive Studios Facebook page, which Im including here mostly due to the fact that Facebook despises readable text. Historically, “comp” was short for a “comprehensive,” a carefully made sketch created to give the client an exact idea of what the final advertisement would look like. As recently as 25-30 years ago, these were produced using the technology available at the time — Letraset type, marker pens, stats, airbrush, etc. Comps were used to persuade the client of a layout’s worth. Much like today, client’s want to be shown, not just told about a concept. In today’s digital age, it is relatively easy to create nearly finalized designs, but just a couple of decades ago, it was a cost prohibitive process to prepare a “comp” with type and photographs. There was no iStockphoto®, no Flickr. You’d have to set up a photo shoot, or hire an illustrator (a person, not software), order type, get stats, make a mechanical and send it to a service bureau so they would make a dye-transfer print. These processes were prohibitively expensive and took too much time to use just to get a client to sign off on a concept. A marker comp was both expedient and affordable (besides markers, there were watercolors, tempera, pastels, Dr. Ph. Martin’s™, Prismacolor®, brushes, airbrushes). Layouts were drawn by hand—some art directors could actually draw and letter. With their bare hands! Making changes in the middle of the process was manageable within an agency’s bullpen. The work produced by a good comp artist was fine work and some comps were breathtakingly wonderful. 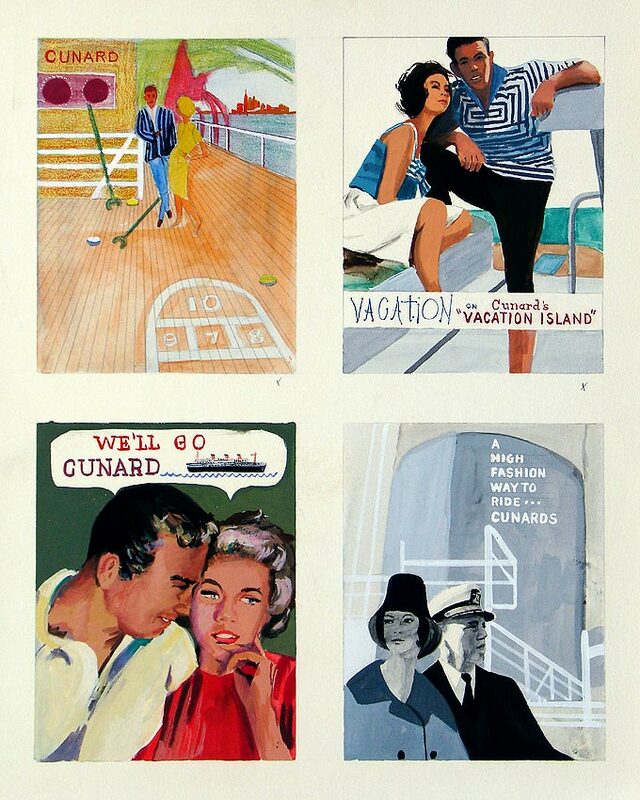 I had trouble finding some of these vintage comprehensives, but it looks like Eric Wrobbel found some great marker comps for Cunard Cruise Lines. Its really interesting to see hand drawn illustration, water colors and markers to “sell” a design. The rough, handmade feel contrasts starkly with the digitally manipulated and clean feel of a comp that is more contemporary. Complimentary. Is what the other meaning of comp stands for. In, say, a casino or hotel room. I mention this because I couldn’t for the life of me think of what it was, and then it suddenly dawned on me. I am so glad we had this little chat. In the design community “comps” are proof of concepts created to show a client without dedicating a large chunk of time building something out. For instance a website comp would be an image that needs approval before and code is ever written.